The students are working toward completing the design, construction and testing stages for the solar house. 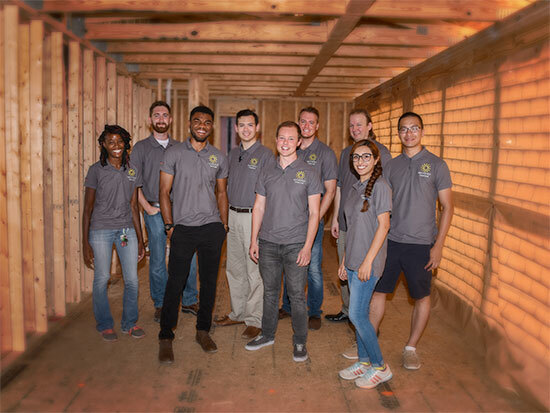 Once the house has been completed and tested on the UAB campus, it will be disassembled and transported to a competition site, where it will be reassembled in a village along with the 11 other solar houses. The team’s solar-powered house must be equipped to run all of the usual appliances and accoutrements of any modern house at the same level of a comparable house on a conventional power grid, but with the only source of energy coming from what the house is able to harness itself. The house will operate solely by its own power, and it will create additional power, making it a net-positive structure. In other words, its efficiency will allow it to produce more energy than it consumes, leaving the homeowners or users of the structure with extra energy to use in other ways. Because the houses must be suited to the local climate, the Alabama house will be designed with tornadoes in mind. The house will include at least one room with tornado-proof walls, incorporating building panels designed by materials engineers at the UAB Materials Processing and Applications Development Center. The design will allow for the house to be efficiently reassembled surrounding that tornado-proofed room, should a natural disaster occur. The house will also be built to beat the Alabama heat. A UAB-developed system, which helps cool the house while reducing energy costs, uses a liquid desiccant system in combination with a solar collector to take water out of the air. Through that process, the device dehumidifies the air inside the home at night and recharges the material during the day, reducing the overall load on the home’s air conditioning system. The house will be tested in advance of the judging to ensure it produces enough energy to power all appliances. For example, students will be required to wash laundry, and clothes will be checked to make sure there is enough power for the dryer to fully dry the clothes. Other appliances will be checked to make sure they meet normal expectations, such as a water heater that can sustain hot water for the typical length of a shower. The house will also have to provide sufficient energy to charge an electric car enough so that the car can be driven 25 miles during the competition. The team will be required to prepare meals for two dinner parties at which they will host teams from other universities. They will also host a game night using the house’s audiovisual equipment with snacks prepared in the home’s kitchen. Bonus points will be awarded for any excess power generated by the house. The surviv(AL) team and supporters unveiled the beginning stages of the house in a ceremony at the construction site.“We want to fight the misconception that a house using renewable energy means compromising on comfort or performance,” Taherian said. The teams will showcase the houses to the public and provide free tours of renewable energy systems and energy-efficient technologies, products and appliances. There, the houses will be judged according to strict criteria in 10 separate categories, ranging from architecture and engineering to the performance of the home’s appliances. The winner of the competition will be the team that best blends affordability, consumer appeal and design excellence with optimal energy production and maximum efficiency. Once the competition is over, the house will be returned to UAB and will become a permanent net-positive building on campus, where it will be available for sustainability research and other uses, all while helping raise awareness and educating the public about renewable energy. UAB’s team of approximately 60 students is being guided by faculty in the School of Engineering, in partnership with UAB Sustainability and the Collat School of Business, as a component of the project includes marketing and communications activities. Industry partners have been equally important in the progress of the project. Williams Blackstock Architects, for instance, has offered its services in helping students, faculty and staff with the design of the house. Additional industry partners will be key to the project’s success. 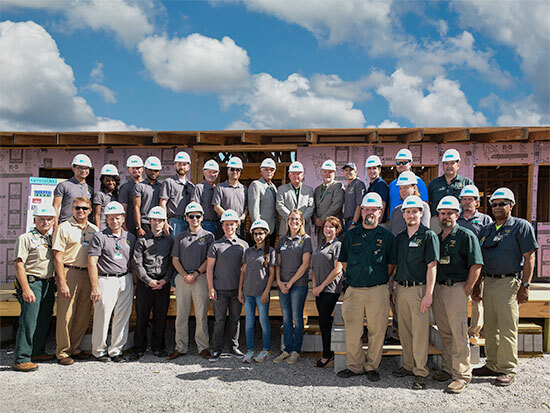 Team Alabama’s Solar Decathlon effort so far has truly spanned across campuses and into the community. The UAB Facilities Division continues to be instrumental to the project through offsetting some costs, providing materials and the construction site, as well as offering construction expertise to the team. Donations are being accepted online on UAB’s Solar Decathlon website. To learn more about supporting this project, reach out to a member of the project’s leadership team here.